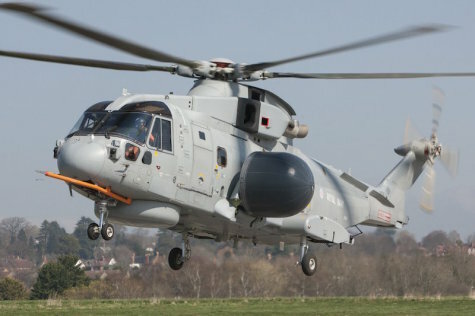 PARIS --- Lockheed Martin, the prime contractor for the Royal Navy’s Crowsnest airborne early warning variant of the AW101 Merlin helicopter, has provided at our request some information about the program, which made its maiden flight on March 28. The company’s statement is published below, with our comments in italics. Crowsnest, the Lockheed Martin-led programme which will provide the Royal Navy with its Airborne Surveillance and Control (ASaC) platform via a role fit Mission System solution onto the Merlin Mk2, achieved a key milestone on 28 March. The designated trials aircraft took off from the Leonardo Helicopters facility in Yeovil, at midday, to commence Aero-Mechanical flight trials. This milestone is key to assessing the flight envelope and handling qualities of the aircraft with the external role equipment fitted, and marks the start of a series of flight trials which will take place throughout 2019. In fact, the aircraft had actually made its first flight several days earlier, and had made several before the official one on March 28. This was still three days earlier than the contractual deadline for first flight, which was March 31. Lockheed Martin worked closely with industry partners and MOD to ensure that essential design requirements were met prior to first flight on 28 March 2019. The first flight enables an extended flight test period to expand the flight envelope of the helicopter with the CROWSNEST role equipment installed. The next key phase of the programme is Electromagnetic Compatibility (EMC) testing. Lockheed Martin is committed to delivering the CROWSNEST capability with its industry partners; dedicated management teams and resources are in place to ensure the programme is delivered successfully. The next program milestone, set for September 30, is the conclusion of Flight Trial Activity required to support initial Aircrew Training, according to the SRO letter, with aircrew training due to begin by October 10 and the delivery of the Airborne Surveillance & Control Mission Trainer by November 14. The Crowsnest development contract was awarded by the Ministry of Defence to Lockheed Martin, the prime contractor, on Jan. 16, 2017. Thales UK has been subcontracted to provide the radar system. -- Lockheed Martin, as the prime contractor for Crowsnest, will integrate the selected Thales solution on to the Merlin Mk2 helicopter fleets. This work will be supported by Leonardo Helicopters, who will modify the fleet to fit Crowsnest. The contract also includes £9 million for initial provisioning of spares to support the Crowsnest system during training and operational deployment. -- Chief Executive Officer of the MOD’s Defence Equipment and Support body, Tony Douglas, said: “Crowsnest will play a key role in protecting the Royal Navy’s future fleet acting as the eyes and ears for the new Queen Elizabeth Class aircraft carriers. This state-of-the-art project will demonstrate how we are providing world-leading, innovative equipment to our Armed Forces. -- The Thales solution is an updated and improved version of the Cerberus tactical sensor suite, currently in service on the Sea King Mk7 helicopter. -- The design is comprised of a single mechanically scanned radar head, which uses an innovative system to provide 360-degree visibility from the underside of the helicopter, which then folds up to the side of the aircraft when not in operation.